When we have a dream, we wish to have a golden dream. 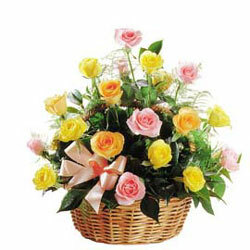 Two dozens elegant pink and dozen yellow/orange roses come together with field of delicate baby's breath on plumose greenery, and the result is, a gorgeous display of golden beauty. A great way to show passion and what we really like to say.